This is one occasion when it will be impossible to find a similar 'special edition' of this amusing release from Walking Ware in their 'Running Ware' series. This one is an Eggcup with a special 9ct Gold decorated pair of shoes, together with red spotted and green striped socks with a green band - and - as a special difference, it is also standing on a plinth/stand. It is backstamped with the Lustre Pottery's backstamp and a 'cup' drawing with Walking Ware, also indicating the date of 2005. This was probably manufactured after that date and certainly decorated in 9ct Gold much later during 2011. 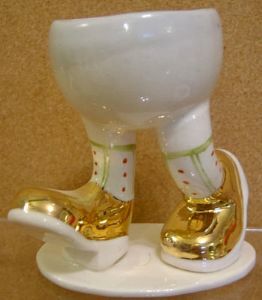 The orginal was designed by Roger Michell (Lustre Pottery) for Carlton Ware, this particular piece is an exceptionally 'hard-to-find' egg cup since, as with all the gold items, it is exclusive to Artware Collectables. There is no crazing at all and there are no chips/nibbles nor restoration work. There is some slight discolouration in the well of the eggcup. The overall height of the Egg Cup is just over 3 inches (8 cms).